August 3, 2018 -- Pure IP launched the ONE SD-WAN voice communications solution providing organizations with the security, reliability, and redundancy of a point-to-point or multiprotocol label switching (MPLS) connection without the costly infrastructure and significant time commitment required with a traditional, physical connection. 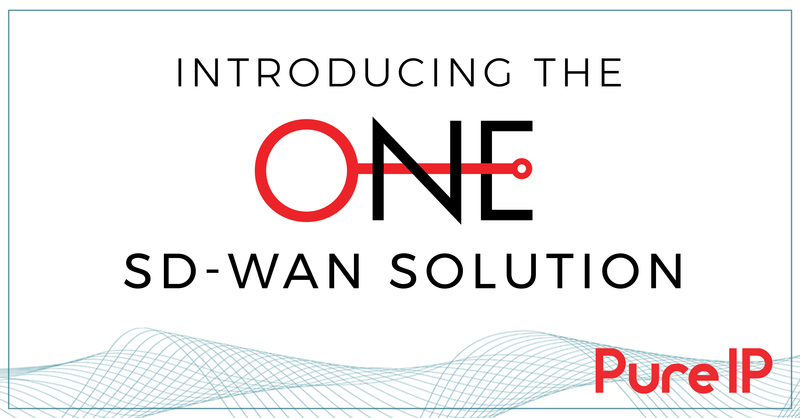 The Pure IP ONE delivers an efficient, cost-effective, and fully-encrypted SD-WAN connection -- via one pre-configured device, one network, and one vendor. The solution is designed to be flexible and agile – deployable in as little as two weeks -- and is able to seamlessly integrate with organization’s existing SD-WAN, MPLS, or point-to-point connections. The ONE is engineered to be a dependable, secure, and hassle-free experience utilizing Virtual Private Network (VPN) tunnels to geo-redundant Points of Presence (PoPs) with automatic re-routing in case of fail-over -- requiring no action or intervention from the user. The new solution is supported by Pure IP’s in-house, fully-staffed network operations centers that are strategically located in the United States, United Kingdom, and Australasia. A dedicated team of engineers that possess technical knowledge about the unique voice network of each client proactively monitor and maintain the ONE system 24 hours per day, 7 days per week. They are directly and immediately available to answer any questions about the system. Paired with Pure IP’s global coverage in over 80 countries, the ONE provides multi-national corporations the ability to route multiple calls from local numbers to anywhere in the world — without the expense of dealing internationally. For more information about the Pure IP ONE SD-WAN voice solution, please visit out Contact Us page. About Pure IP: Pure IP specializes in unified voice communications and SIP trunking solutions tailored to keep FTSE100 companies, Fortune 500 corporations, and carrier partners connected to their regional and international offices. Our engineers are experts in consolidating disparate international sites, reducing complexity, streamlining services, and simplifying telecom infrastructure. Pure IP is proud to offer one of the largest next gen voice communications global networks including: international coverage in 80+ countries, ISDN-PRI replacement in 30+ countries, cost-effective local PSTN conference numbers in 65 countries, as well as 11 worldwide Points of Presence (PoPs).